DIGITAL DOWNLOAD. PRINTABLE Art. Digital Prints. 8 x 10 Printables. Home Décor. Wall Art Quotes. Instant Download Art. Motivational Art. 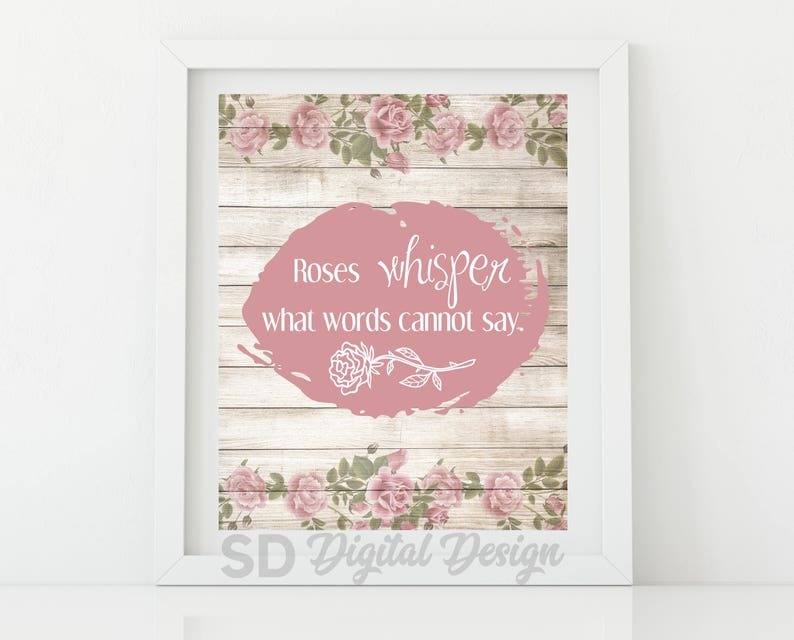 SD Digital Design is a shop filled with printable art and one-of-a-kind digital designs that share a message, offer inspiration or make you smile! The prints have been designed just for you in a digital format to instantly and affordably decorate any room in your home or give as a special gift for any occasion. •	Add this item to your cart and proceed to checkout. With every order I include easy instructions, tips and recommendations on the optimal way to print your files. Please visit www.etsy.com/shop/sddigitaldesign to see all of the designs offered in this shop! Please note that I do no accept Returns/Exchanges/Cancellations because the products are offered via a digital file. However, if you are not satisfied, please let me know and I will work with you! I want you to be happy with your purchase! To the best of my knowledge all quotes, graphics, photos and elements that I have used in my designs have been created by me or fall under the Public Domain Creative Commons License or have been purchased with the rights to allow Commercial Use. For personal use only. Not for commercial use. You may not share, forward, sell, redistribute or transfer the original digital images. Please do not claim the file as your own. Please do not copy my designs. Designs are copyrighted by SD Digital Design. If you are satisfied with your purchase, Etsy Feedback on my shop is always appreciated! I also LOVE to see your photos and how they have been displayed in your home. Please send me your pics! I’m workings on ways to showcase your art displays! Your business is appreciated much more than you know. Thank you for taking the time to come into my shop and look around. I hope you will be able to find a print that inspires you and will make you proud to display in your home! Suggestions on what you would like to see? I would love to hear them. Please scroll down below to “Shop Policies” There is more information available under “FAQs” in which I’ve tried to address questions you may have. If not, please contact me anytime. Lovely print, very comprehensive instructions for printing. Friendly customer service follow up message. Recommended. All of my prints are currently sized at 8" x 10" and are priced at $5.00 or less for regular prints and $10.00 or less for personalized (made to order) prints. Additional sizes will be offered in the future! WHERE CAN I GET MY DIGITAL ITEMS PRINTED? You may instantly print your items at home or from Photo Labs (Walgreens/Costco/Walmart/Snapfish/Shutterfly) or Print Shops (Staples/Office Max/UPS Store/FedEx). Complete Printing Tips/Instructions/Recommendations are included with every order! WHY DOES MY PRINT APPEAR BLURRY/PIXELATED? All of my designs are created at 300dpi high resolution. Please make sure you download the Etsy digital file to a computer or laptop. Do not right-click and "save as". Please do not download to a phone or tablet. Lower resolutions could also be due to your printer settings at home or a technical error with your printing vendor. Please make sure to read the Complete Printing Tips/Instructions/Recommendations which are included with every order! WHAT ARE THE ADVANTAGES OF PURCHASING A DIGITAL DOWNLOAD? WHY DOES'NT THE COLOR OF MY PRINTS MATCH MY COMPUTER SCREEN? Please note that color variations vary from one screen to another as well as one printer to the next and on different types of paper. Although I am not responsible for any color differences between what you see on your screen and the printer version I do include Complete Printing Tips/Instructions/Recommendations with every order! DO YOU HAVE ANY IDEAS FOR DISPLAYING MY ARTWORK? WHAT'S THE DIFFERENCE BETWEEN A "REGULAR" PRINT AND "PERSONALIZED" PRINT? A "REGULAR" print is one that has already been created and is available as an instant download from my shop after payment is received and processed. A "PERSONALIZED" print is one that is customized just for you based on the information you provide to me. Because these prints are made to order, they may require up to 48 hours to complete (usually much quicker). You will still need to add the item to your cart and purchase, however, it will not be available as an instant download initially. Your digital files will be sent to you upon completion of your order and will then be available for instant download! MY PRINTER IS GIVING ME PROBLEMS. CAN YOU HELP ME? I am responsible for the design of your file and not the printing aspect. Please note that color variations and print quality will differ from one screen to another as well as one printer to the next plus different types of paper and ink quality. If you choose to work with an outside printing vendor, please ask them for recommendations to achieve the highest print quality possible. If you have issues with your own printer, please refer to the manual that came with your printer. Unfortunately, I cannot provide technical support.